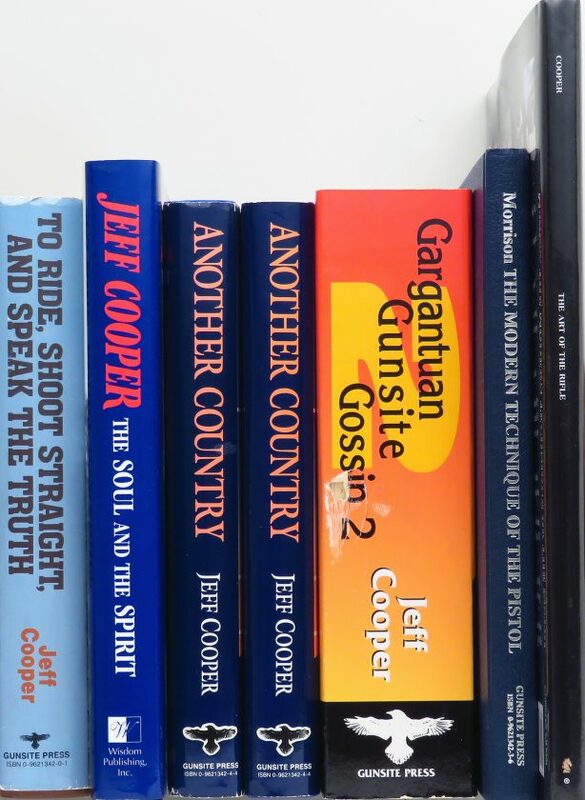 Grouping of seven Jeff Cooper books from the library of his former editor, many inscribed, from the estate of Tom Siatos - Sportsman's Legacy, Fine firearms, related books and sporting collectibles. Representing estates, collectors and nonprofit conservation organizations. 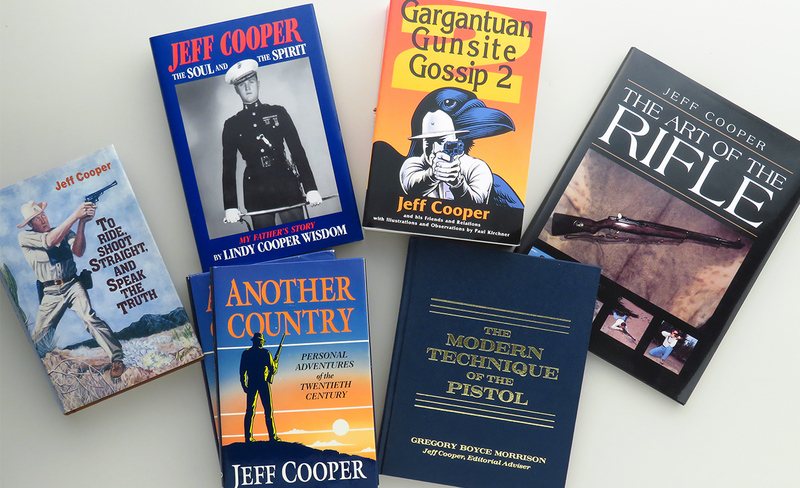 A grouping of seven special books written by or directly-related to Jeff Cooper, many inscribed, from the estate of Cooper’s former Guns & Ammo Magazine Editor Tom Siatos. To Ride, Shoot Straight and Speak the Truth, 1988, Gunsite Press, inscribed “For Tom Siatos who opened the door, Jeff”, excellent condition with very good DJ; Jeff Cooper, The Soul and the Spirit by Lindy Cooper Wisdom, 1996, Wisdom Publishing, excellent, signed by both Jeff Cooper and the author; Another Country, 1992, Gunsite Press, inscribed “For Tom Siatos, Jeff”, excellent; Another Country, 1992, Gunsite Press, inscribed “For Tom & Brigitte for auld times sake, Jeff”, excellent; Gargantuan Gunsite Gossip 2, 2001, Gunsite Press, good; The Modern Technique of the Pistol by Gregory Morrison, 1991, Gunsite Press, excellent; The Art of the Rifle, 1997, Paladin Press, inscribed “For Tom Siatos, for old times sake!, DVC, Jeff”, excellent. TOM SIATOS (1923-2008) spent the majority of his life in close association with firearms and hunting. His professional contributions, tremendous category knowledge, bottomless enthusiasm and bold personality influenced the firearms industry and outdoor media to such a degree that it remains a viable force today. Tom was the second editor of Guns & Ammo Magazine. As such, he was responsible for the general tone of the iconic publication. A consummate hunter, spectacular all-around shot and true connoisseur of fine firearms, his interests spanned the full spectrum of the shooting sports. In 1942, Tom enlisted in the Marine Corps. He served in units that scouted and destroyed isolated enemy communication sites on a number of Pacific islands, eventually receiving a battlefield commission. After concluding his service, he attended UCLA and later joined the fledgling Petersen’s Publishing Company in 1958. A series of promotions led to him to become vice president of the Petersen’s Publishing Outdoor Division, which thrived under his leadership. Tom Siatos was a mentor, visionary, leader, father figure and a true original. We will never see his like again. The price is firm. $1,000 plus shipping.